Everybody needs a little Lilly. In my heyday as a pink-and-green-blooded prepster, I used to pull off the whole Lilly look -- patchwork shift, Jack Rogers sandals, patent headband. 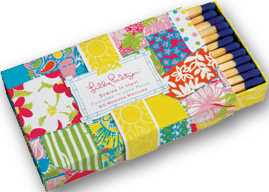 But even though my personal style has evolved, I can still have a little of that classic Lilly Pulitzer fruit punch-drunk color in my life with her new matchbooks. At $4.50 a box, I might fill up a little vessel in my pink-tiled bathroom... Lilly Pulitzer Strike It Hot Matches first spotted in the June issue of Country Living, available online at Preppy Princess.